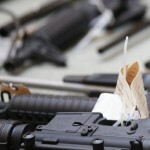 The East Brunswick police, as well as prosecutors, have a strong interest in enforcing New Jersey’s weapon possession laws. The term weapon includes not only a handgun, knife, shotgun, or rifle but also any object that can be used to cause bodily injury to another. Therefore, an object like a bat, bottle, hammer, or pipe can also constitute a “weapon” if the intended purpose for possessing it is to inflict or threaten another person. The potential penalties can be very extreme in weapon cases, particularly when they involve a pistol, revolver, handgun or other form of firearm. Our attorneys have decades of experience defending all forms of weapon offenses in East Brunswick and at the Middlesex County Superior Court. A former prosecutor on our staff or other qualified defense lawyer in our East Brunswick Criminal Office is available immediately at 732-227-1200. Do not hesitate to contact us since initial consultations with an attorney are free. Possession of a Prohibited Weapon. Possession of a Weapon for Unlawful Purpose. Certain Persons Not To Have a Weapon. These violations generally fall into three (3) grades in terms of severity – fourth degree, third degree or second degree crimes. A second degree weapon offense can lead to a period of incarceration of between 5 and 10 years and may also lead to a fine of up to $150,000. A third degree charge carries 3 to 5 years in prison and a $15,000 fine. A fourth degree crime involving a weapon results in up to 18 months in state prison and a fine that can reach $10,000. As if these lengthy periods of incarceration and fines were not bad enough, it is worth mentioning that many of these weapon offenses also fall under the Graves Act and No Early Release Act (NERA). These two Acts impose mandatory minimum periods of incarceration. An individual is not eligible for parole until the related minimum term of incarceration has been satisfied. NERA is the more serious of the two and requires that a defendant serve at least eighty-five (85) percent of their term of imprisonment until that may be considered for parole. While all of this may paint a depressing picture if you were arrested for a handgun or some other form of weapon possession, do not think that there is nothing that can be done on your behalf to minimize your exposure to potentially life-changing criminal liability. Here at the Law Offices of Jonathan F. Marshall, the lawyers on our staff have decades of experience defending weapon charges throughout Middlesex County, including East Brunswick. Our team of attorneys even includes the former director of the gangs, guns and drugs task force of the Middlesex County Prosecutor’s Office. If you were charged with possessing a handgun without a carry permit, possession of a weapon for unlawful purpose or any other offense of this nature, we have a local attorney with the tools to achieve the best result in your case. Call our East Brunswick Office at 732-227-1200 now for a free consultation with lawyer who can help you avoid jail and other consequences in your weapon case.